In early 2013, the Brazil national soccer team was studying science-backed ways to perform more efficiently on the field. With both Copa America and the World Cup approaching fast, the team looked to one of their sponsors, Gatorade. At the same time, the sports drink giant had been looking for a way to bring personalized drinks for athletes to the next level, and wanted to start piloting the program with a professional team. “If athletes are using a lot of personalization in everything that they do—from training programs to their equipment—what about their sports drinks?” asks Xavi Cortadellas, global head of innovation and design at Gatorade. Working with the Brazil national soccer team was the perfect opportunity. Cortadellas proposed that the team would work with the company’s sports scientists to test the athletes and tailor formulas specific to each player and each game or practice. Tracking hydration levels would provide the players an advantage on the field. The first version of the program launched for Copa America in 2013, and the beta version of the program was used by the Brazil team for the World Cup in 2014. This was the beginning of Gatorade’s Gx, a sports fuel customization platform that changes how athletes hydrate and fuel, and a new way for Gatorade to redefine the future innovation of the brand and expand its global footprint, a task perfect for Cortadellas. Then, as Cortadellas was looking for a position at Nike headquarters in Portland, Oregon, the perfect opportunity at Gatorade came along: senior director of global brand design. What attracted him to the role was the design focus. For the first three years, Cortadellas helped define the look of the Gatorade brand, focusing on packaging and retail. The company then decided to join Cortadellas’s brand design team with the long-term innovation team to create the Innovation and Design function, which he still leads today. Now, he estimates about seventy percent of his time is focused on innovation. Cortadellas and his team, along with external partners, look to push the limit and go beyond being just a sports drink company. One way is designing specific sports nutrition products and creating a one-stop shop for athletes looking to perform better on the field, court, mat, or ring. With a lot of internal expertise about engineering food within PepsiCo, Cortadellas says Gatorade has many interesting opportunities at its fingertips, such as creating a protein yogurt specialized for athletes. Another is expanding the brand globally. Gatorade is dominant in the United States, Cortadellas says, but there are big opportunities globally to grow the brand—including in Europe, Asia, and Latin America. Hence the partnership with teams such as the Brazil national team or FC Barcelona. This provides Gatorade with an opportunity to not only grow the brand but also reinvent sports drinks through personalization and technology, as seen in the Gx system. In the next five to ten years, Cortadellas says he sees the Gx system, and Gatorade’s research in sports technology, growing. Gatorade is developing a sweat patch that will be able to read in real time how much the athlete is sweating and be able to better predict their hydration level and thus better tailor the hydration recommendation. Sweat patches are only the beginning, as Cortadellas sees similar sensors being integrated into sports apparel to better serve the athlete’s performance. “Someone said we don’t talk about smartphones anymore because all the phones are smart. 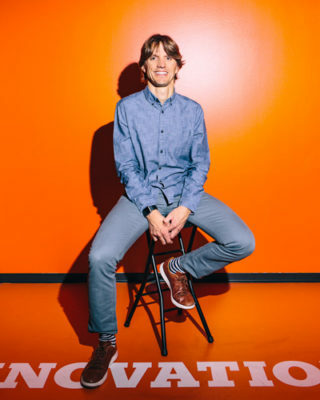 I think with apparel and sports equipment, in a few years, we won’t be talking about smart apparel because all the apparel will be smart,” he says. Brazil might not have won the World Cup in 2014, but Gatorade found success in executing its Gx platform. They began pairing with the Kansas City Chiefs, the Boston Celtics, and the University of Florida, even partnering outside of professional sports with IMG Academy and other elite high schools to finesse the platform. Last year, twenty teams across the globe were using the Gx platform. This year, Gx will launch at the commercial level. “This proves that something that starts very small could become accessible to millions of athletes,” Cortadellas says. I was the type of kid trying all sports—big time, soccer and skiing. How do you stay active now? Mainly through doing triathlons. My 2017 resolution is to learn how to kite surf . . . I’m getting there! What personal habit adds to your overall wellness? I try to combine training with the right nutrition and the right recovery—and make sure to not get too obsessed with it. I recommend integrating wellness into your personal lifestyle. What is your most-beloved sports team? FC Barcelona is my team, but I try to follow other sports and teams as well. Who is an athlete that has impressed you? Surfer Kelly Slater. He has been able to dominate and even redefine modern surfing.